Angry Birds may be one of the most popular apps of all time, but it’s also not exactly a spring chicken. And so, to boost its downloads, publisher Rovio is now making the original iOS versions for iPhone and iPad free and getting named the App of the Week on the App Store. According to Ouriel Ohayon of Appsfire, who was the first to have spotted this, this is the first time Rovio has taken down the paywall on these versions. 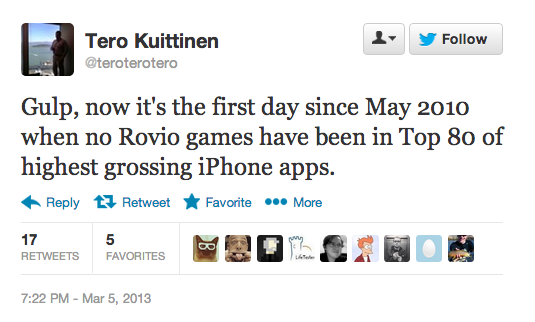 The moves come as some have observed that Rovio has of late fallen out of the top 80 highest grossing iPhone apps — for the first time since May 2010. This, too, may be a reason why Rovio has chosen the above image, touting it as the number-one app of all time, as the splash page for the app as it appears on the App Store. The apps normally cost $0.99 for the iPhone app and $2.99 for the iPad app — they changed to free about an hour ago, Ohayon tells TechCrunch. He says that this is the first time in 24 updates to the iPhone app where the price has gone down to zero. “Why [did] they do it? Because there is in app, because [of] free distribution, because [it’s an] end of life cycle game,” Ohayon explained to TechCrunch. Note that these two Angry Birds apps are technically now “freemium”, in that there are still in-app purchases in the app, as you can see illustrated here. But changing the basic download, and access to the basic game, to a free model may well prove to give the birds one more catapult to get them back to the top of the app store. As part of the release out today, Rovio has also added in 15 new levels for the game. Ohayon tells us that he thinks this will lead into Apple making the two Angry Birds their free apps of the week, which should also give a boost to Rovio’s download numbers. Those changes, he says, should be coming through in about six to eight hours. “They usually ship on Friday but change the label on Thursday night EU time,” Paris-based Ohayon says. We’ve also reached out to Rovio for a comment on this and will update the story with any more that we hear back. Update: Rovio has confirmed the app of the week will be Angry Birds, and we’ve updated the first paragraph to reflect that.